today dat person is knwn as BIG BOSS. .....change it to The Papa!" Once George Clooney (Danial Ocean of Ocean's 11) met Rajni, said i can steel anything 4m any where,at least in this steeling business i'm better than you,and went on to show Rajni..... Rajni was about to open a sealed gasoline can(Rajni likes his drink neat),when this conversation started,he opened it and found its empty,why?Clooney stole the gasoline from inside the sealed can. Rajni just smiled,and said so you think u r btr dn me?Ok,i'l show you.A old man was passing by,Rajni pointed that old man and asked Clooney,c that old man?right after the question that old man turned into a little boy.Clooney was suprised,he asked,what just happened?what did u do? Rajni smiled,and said,ohh nothing,just stole his age. 1. When Rajanikanth gives you the finger, he's telling you how many seconds you have left to live. 2. Leading hand sanitizers claim they can kill 99.9 percent of germs. 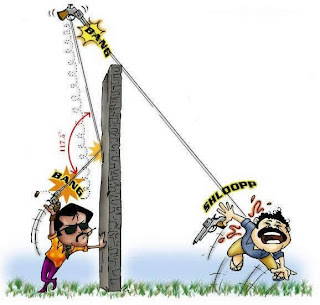 Rajanikanth can kill 100 percent of whatever he wants. 3. Rajanikanth can set ants on fire with a magnifying glass. At night. 4. It takes Rajanikanth 20 minutes to watch 60 Minutes. 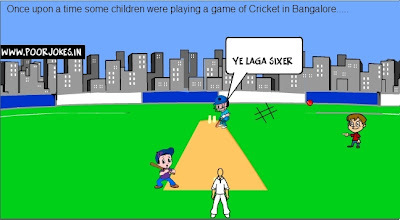 Bowler bowls it and Cheeru hits with tremendous power…...the ball goes far away and UMPIRES are forced to give 12 runs for that. Bowler bowls it and Shahrukh glides it to 3rd man….....the ball goes to boundary line Shahrukh runs for 3 runs, fielder throws at non-striker it misses the stumps and goes for over-throw, ShahRukh runs again for 3 , this time fielder tactic fully throws at Keepers end, Keeper Misses it goes for a 4 runs. In the background Vande Mathram…. 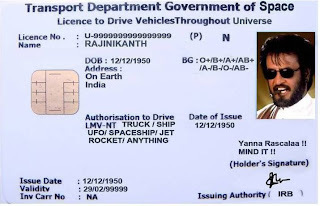 Latest of Rajnikanth - This can't get any better!!! #Rajnikanth planted the idea for the movie"Inception" into Christopher Nolan's mind while he was dreaming. #Rajnikanth knows who the F*** is Alice! The Bermuda Triangle used to be the Bermuda Square, until Rajnikanth kicked one of the corners off! Superman, Batman, Spider man, Iron man and James Bond visit Rajnikanth on Guru Poornima each year! Rajnikanth will deliver a pizza as soon as you think abt it, even before you order it! 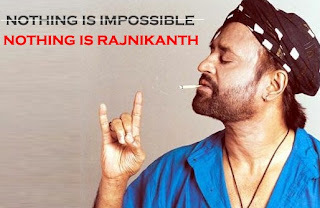 When you say a 'No one is Perfecta/ Rajnikanth takes this as a personal insult.